225 Pineapple Street, Satellite Beach, FL.| MLS# 835765 | Free Brevard County MLS Home Search. No Agent Needed. Daily Auto-Email Listings of All Brevard County Homes and Listings For Sale That Meets Your Home Buying Criteria. Brevard County Real Estate Market Information. 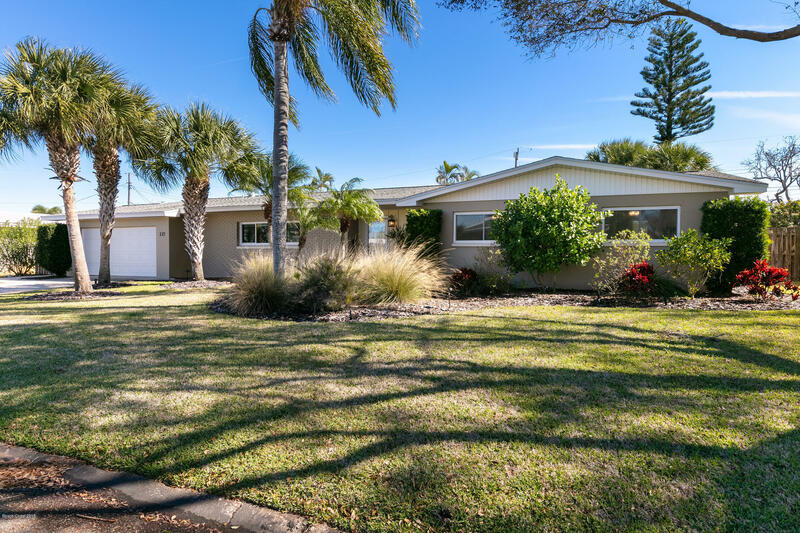 Beautifully updated and well maintained 4 bed/2 bath home located in the heart of Satellite Beach, 3 blocks from the ocean, and close to many excellent schools! Polished terrazzo and modern laminate flooring guides you through this luxurious home. The kitchen showcases stainless steel appliances, granite countertops, recessed lighting, modern wood cabinetry, and access to the screened in back porch. Large master suite features walk in closet, and gorgeous contemporary bathroom. Guest bathroom showcases updated vanity, and laminate wood flooring. Outside, lush, extra wide lot encompasses sparkling salt water pool resurfaced in 2015 and two well kept storage sheds. This home offers nothing but relaxation, with a charismatic modern touch.